The Thingamabody is NEW for 2012. 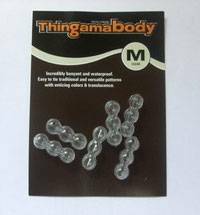 After the success of the unibobber the thingamabody is the ultimate buoyant body. It is a 3 segmented body with air running throughout the body. It has a hook slot in the bottom to make it easy to tie onto the hook and the white and clear versions can be coloured with permanent markers to give an endless selection of colours. The small body can be used on a size 10 nymph hook and the medium can be used on a size 6 or 8. HAND MADE buoyant mayfly spinner bodies complete with tails unbelievably realistic! 3 per packet. Spinner Bodies are avilable in 3 colour options and two sizes. Latex bodies & legs - 4 per packet. Superb ultra heavy tungsten shrimp backs in natural tungsten. Will not chip or dull and makes tying scuds and shrimps so easy. Use size XSmall on hook sizes 16 and 14. Use size Small on hook sizes 14 to 12. Use size Med on hook sizes 12 to 8. These tungsten bodies are best used as a thorax on nymphs where you don't want a bead on the front of a dressed fly. They add alot of weight while still keeping a nice slim profile. Perfect for Pheasant tail nymphs or even hidden under dubbing and body materials for other types of flies. Easy to fit on to hooks due to slotted design. 2.4mm best for hook sizes 16 to 14. 2.7mm best for hook sizes 14 to 12. 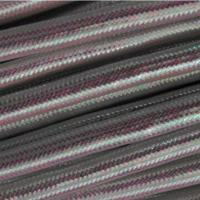 3.2mm best for hook sizes 12 to 10. 3.6mm best for hook sizes 10 to 6. Simple lead which can be squeezed over the shank of hook, it adds weight and provides the correct shape to dress the fly. Available in 4 sizes. Pre-formed bodies which can easily be slipped or tied on to a hook to form a floating Terrestrial body. 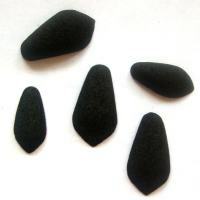 Available in Small (12mm) and Large (15mm). Pure latex. When tied to hooks these represent perfect, air-filled bodies to float in the surface film. Excellent for Mayflies, Daddy Long Legs and Emerger patterns. Moulded from high density polystyrene, these Popper bodies are excellent floaters, each pack contains the correct 'popper' cranked shank hooks, great for all predator type flies. 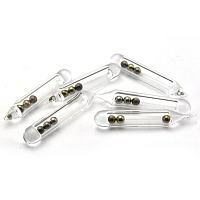 Small, steel balls encased within a glass tube. 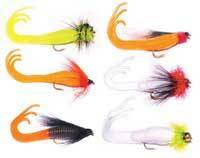 When tied into the bodies of large Streamers, Saltwater and Pike flies will provide an enticing rattle to attract predatory fish. May be used to great effect in conjunction with Gator Braid. 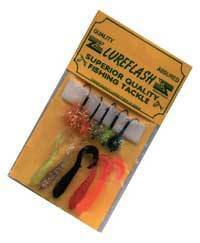 The original flash tubing for Streamer, Salmon and Saltwater bodies. The individual strands may be teased out to form a tail. 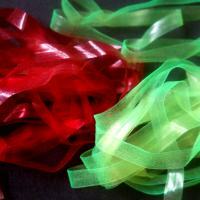 A 6mm wide translucent material of considerable strength and elasticity. Good for creating bodies and wingcases. Length 2 metres. Flexible tails which waggle when pulled through the water. The tails may be threaded on the hook and held in place by the dressing. Available in two sizes; small (1.5") and medium (2.5"). Five tails per pack. The phenominal success of the twister waggler tails has now gone one stage further with the remoulding at the end of the tail which split into 3 sections, creating more movement and vibration, encouraging more fish takes. Well finished with epoxied body and girdle type rubber attractors with the addition of some rubber tailed wagglers. No fish will be able to resist them. 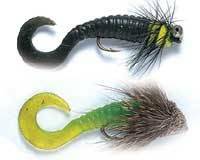 This tubular body material was developed to meet the need for a soft, realistic nymph tying material.  Stretch it from size 4 to 16 hooks.  Colour it with indelible pens.  Slip it over the hook on small sizes.  Fill the center with liquids.  Makes detached Dry Fly bodies.  Change colour shade by changing the underbody colour.  Thread with Tinsel, Floss Silk etc, for ribbing effect.  Weave easier than any other material. 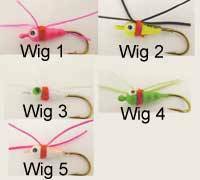 A cleverly designed waggle tail kit that includes five assorted waggle tails and five pre-tied fly heads with a little anchor device to lock the waggle tail into place without the aid of glue. If the body colour needs to be changed, simply pull the existing one off the hook shank and then push the new one on. Easily done without re-tying a new fly onto the line.